Set your metronome to 80 beats per minute. Form a C chord. We’ll only be using the first four strings here, so you don’t need to fret anything on the fifth or sixth strings. We’ll abbreviate this to 1d 2u 3d 4u. Now form a G7 cchord. Play the same pattern: 1d 2u 3d 4u. You want to repeat these steps until you can play them in a very relaxed, effortless way with absolutely no mistakes. Aim to make each note clear and strong with no extra noise from fret buzz or hitting extra strings. I like to treat this exercise as a game: I have to play the pattern 4 times in a row on the C chord, then 4 times on the G7. I can’t move on to the next pattern until I have played 4 good repetitions on this pattern on each chord. This list is simply showing every possible combination of the first 4 strings. In each pattern, you are playing the standard down-up alternating rhythm with your picking hand. Try to use as much of your right arm as possible from the elbow down through your fingers. When the larger forearm muscles are sharing the work, there will be less strain on the smaller muscles and tendons in your wrist and hand. As you become more comfortable with this exercise, you will be able to speed up the metronome. You will find that you can play single-string lead lines with more drive and better timing after working out on this exercise every day over a few weeks. You can also apply this to fingerstyle playing, using the standard “p i m a” picking on the first 4 strings. 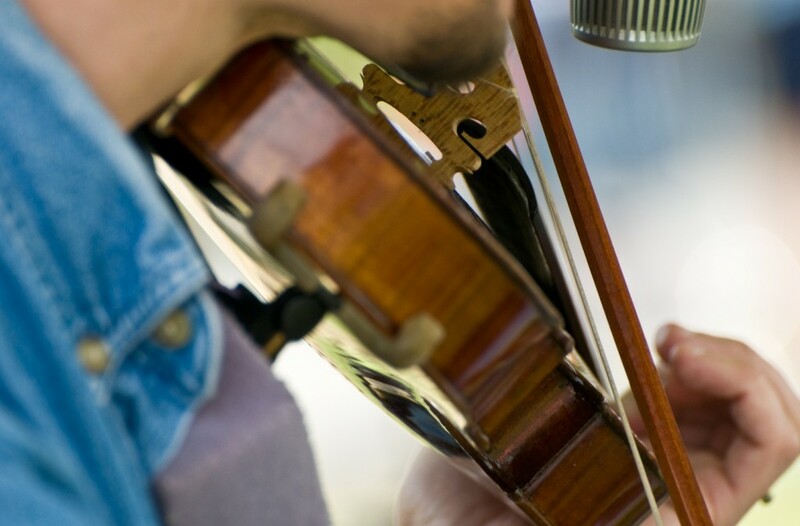 “Cross-picking” is a common term among bluegrass guitarists and other flatpickers that refers to playing melodic or arpeggiated patterns across multiple strings, so that each note is played on a different string than the previous one. One way to cross-pick is to use alternating down-up strokes, as in the exercise above. some flatpickers use alternating strokes exclusively. Others use more fluid stroke patterns that only change direction when necessary. Another approach is to use as many down strokes as possible. I mix all of these approaches in my playing and apply something different to each unique situation. Here is another set of patterns with some new pick directions to improve the flexibility in your picking hand. You will get away from standard down-up picking here. For the first one: 1u 2u 3u 4d means playing an up stroke on the 1st, 2nd, and 3rd strings, then play a down stroke on the 4th. Rest strokes are especially good for cross-picking patterns like these. use the same approach with these patterns as described above for alternating strokes. Get out that metronome and play these patterns over C and G7 chords. Aim to play each one as smoothly and clearly as possible. Down strokes sound different than up strokes. So these crosspicking patterns should sound different from the alternating patterns in the first list. over time these exercises will build your instincts, and you will develop a good feel for playing something with harder drive vs. with a more flowing, smooth sound. In addition to the pick directions listed, you can use just about any pick directions you want. You might try playing all of these patterns using nothing but down strokes. Or you can use all up strokes, or all rest strokes. Each approach will add more accuracy in your right hand. All exercises on this page are (c) 2006-2011 by Scott Malyszka. Check out more right-hand workouts with paradiddles in one of my blog posts. Contact me at scott@feelthewag.com with feedback or for details on private guitar lessons.